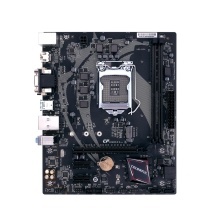 Colorful Battle Axe C.B360M-HD DELUXE V20 motherboard support for Intel LGA 1151 processor(TDP:95W), for Intel Optane accelerating technology and dual channel DDR4 memory as equipped with 2 memory slots. Based for Intel B360 chipset, delivers the great performance enchantment to system and ultimate scalability hardware expending. Perfect for gamers, enthusiasts, seasoned or new builders. Based on for Intel B360 chipset and support for Intel LGA 1151 processors and for for Intel Optane accelerating technology, allowing increased bandwidth and stability. 4 SATA 3.0 6Gb/s ports increasing the data transfer rate between the motherboard and internal storage devices and USB 3.0 10Gb/s greatly speeding up the data transfer rate. Rapid M.2 slot provides up to 32Gb/s data transfer rate for M.2 SSD, supporting PCIE X4 SSD and compliant for Intel® Optane™ Technology, which delivering a large leap forward in reducing latency and accelerating systems for workloads demanding large capacity and quick storage. Nature Audio System for sweet timbre and mellow sound quality, deliver the greatest quality sound resolution and sound expansion. HIFI high-definition audio isolated line isolates frequency signal noises with graceful gentle LED lighting. RTL8111GS kilomega network card port provides up to 1000Mbps Ethernet to deliver optimun network responsiveness. 2 * DIMM slots, support dual channel DDR4 2133/ 2400/ 2600(OC)/ 2666(OC)MHz memory. Adopt military-grade full solid capacitor, full closed-form inductance and a rigid power management module, ensuring strong power supply. Full solid capacitors provide a more stable power supply even under high temperatures ensure a longer service life and boost the ultimate performance.